"Do you know what's in the Bible? Is it true? Is it reliable?" 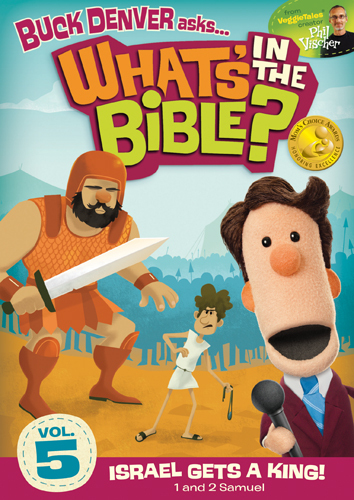 The theme song of What's in the Bible sums up the series perfectly -- the purpose is to walk kids and families through the entire Bible and show the validity of the Scriptures -- all while having fun, of course. Desiree and Elijah were thrilled when we received What's in the Bible? Dvd 5 Israel Gets a King! Combining puppets, animation and real people, Israel Gets a King focuses on 1 and 2 Samuel and the first chapter of 1 Kings. The two 25-minute episodes tell of God's rescue plan through Israel's first kings: King Saul, King David and King Solomon. All three kings made poor choices, but they dealt with those mistakes in different ways. King Saul made excuses for his disobedience. King Solomon felt he was so important that he didn't have to pay attention to God. King David, on the other hand, was a man after God's own heart. When he sinned, King David confessed and asked God for forgiveness (Psalm 51). I appreciate that What's in the Bible doesn't shy away from tough questions or subject matter, but tackles them head on. Israel Gets a King visually describes the Trinity in a section called "Big Questions". It also discusses things such as adultery and murder and explains the Davidic covenant. Israel Gets a King emphasizes that sin has consequences and we need to repent and ask God for the strength to do better like King David did. The overall message is: You can be a child after God's own heart. Here's Desiree(7) and Elijah(5) with their take on Israel Gets a King! Elijah: "My favourite characters are Captain Pete, Ian and Buck Denver because they're funny." Desiree: "The Sunday School Lady and Ian are my favourite characters because one has a magic flannel graph and the other is crazy about ponies and unicorns. What is your favourite part of Israel Gets a King? Elijah: "My favourite parts are the songs Captain Pete sings and the part where he says "That can't be good". Desiree: "My favourite part is when Captain Pete's submarine was sinking because it was funny watching the water go higher and higher." Elijah: "I learned to be honest and always tell the truth -- from "The Boy Who Cried Melon Monkey". I also learned: "Do not bow down to idols." -- (I'm also saying that to give good advice)." Desiree: "I learned that the kings sinned and only David asked God to forgive him." Watching episodes of What's in the Bible? is like visiting with an old friend. That's because Phil Vischer, the creator of What's in the Bible is also the creator of Veggie Tales and Bob the Tomato, himself. Check Out: What's in the Bible? and Tyndale House for more information. Just for fun check out these WITB Colouring Pages! Buy It: You can order Israel Gets a King online on its own or, for a discounted price, in a boxset. You can also purchase it through your local Christian bookstore. Disclosure: As a member of the What's in the Bible Street Team, Tyndale provided me with a copy of WITB DVD 5 Israel Gets a King to review in exchange for my honest opinion. Our favorite character is Chuck Waggin. I like Buck Denver or Chuck Waggin, cool names, and we live in Colorado. Hi! Sorry it took me so long to get your giveaway up on Such Fun to Give. This weekend was my birthday and our anniversary...so we were out celebrating.) It's up on the low entry giveaway list now though. I never knew about this series...but I love Veggie Tales so I bet we'll love this. My littlest loved the clip too...just based on that clip I'd say Captain Pete is my fave. Fun movie! Buck Denver is a great name! I follow @whatsinthebible on twitter as frugalmomto4. Honestly, we have never seen it so we don't have a favorite. I am excited to see it though. I like What's in the Bible? on Facebook. I follow @whatsinthebible on twitter @mrspoofa. My favorite would be Captain Pete! I think our favourite would be Pastor paul.